1. What is the Miracle Maker Leadership Council (MMLC)? 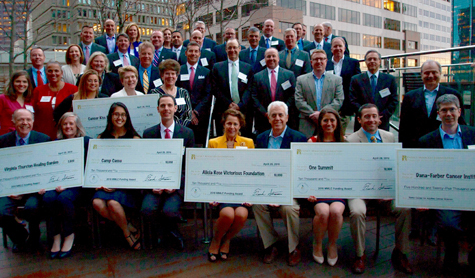 The Miracle Maker Leadership Council (MMLC), comprised of Expect Miracles Foundation’s major donor circles, is a select group of leaders in the financial industry who lead the Foundation’s mission to provide impact funding to life-saving cancer research and patient care programs. 2. What is the role of the MMLC? The MMLC is charged with strengthening Expect Miracles Foundation’s position as the industry’s leading advocate in the war on cancer through financial support, example and leadership. 3. What are the major donor circles of the MMLC? 4. How much of my donation supports cancer research and patient care work? 94% of individual donations support our causes. 6% covers administrative expenses. For MMLC donations, 69% is directed to support research at Dana-Farber Cancer Institute’s Belfer Center for Applied Cancer Science, and 25% is directed to the MMLC Fund for funding awards to promising patient care programs. 5. Are there benefits and opportunities to being at higher levels, and can I elevate to a higher circle at any time? Yes, besides having an even greater impact on patients, members' votes for recipient organizations for the MMLC Funding Awards are weighted according to their circle membership. You can elevate to a higher donor circle at any time. 6. I’m a Young Professional, may I join? Yes, young professionals (age 21-39) may join the Leadership Circle by making a donation of $500 per year. 7. How long is my membership? Members make a 3-year pledge to donate an annual amount according to the Circle they wish to a member of. 8. How is it decided where The Research funding goes? Expect Miracles Foundation is a major supporter of the heart of Dana-Farber Cancer Institute’s revolutionary research and development model, the Robert and Renée Belfer Center for Applied Cancer Science. The Belfer Center addresses key challenges in cancer treatments by leveraging DFCI discoveries and applying them to drug discovery and development. Thus, it is a perfect collaboration for the Foundation’s major donors to also support the Belfer Center as it is at the heart of Expect Miracles Foundation’s mission. 9. What is The Foundation’s Tax ID #? Our Tax ID number is 20-4127495. 10. How is it decided where the Patient Care Program funding goes? The Funding for the Patient Care Programs is decided entirely by the members of the Miracle Maker Leadership Council. Expect Miracles Foundation’s staff opens a Letter of Intent application annually in January and MMLC Members are asked to suggest their favorite cancer patient care charities to apply. Once the Letter of Intent applications are received, the MMLC Executive Committee narrows down the applicants and invites about 6-10 of the charities to complete the entire application. Each MMLC Member is mailed a hard copy book and asked to review the finalist applications. Then, in late March, all MMLC Members are invited to the Selection Summit luncheon where MMLC Members discuss and deliberate on the applications. All MMLC Members are welcome to join in the deliberations. Each Member's vote for which charities should receive funding is weighted according to the circle level the Member belongs to. 11. How do I join the MMLC? 12. How long do I have to fulfill my pledge? Until December 31 each year. 13. How may I make a donation to fulfill my pledge? In the section that reads "Donation Amount,” please enter the amount you would like to donate online today, and the next page will collect your credit card info. Designate Expect Miracles Foundation as the beneficiary of your United Way donation. Please email fheavey@expectmiraclesfoundation.org to let us know when you do this so we can thank you and reconcile our United Way reports! Donating appreciated securities is simple and there are many benefits to choosing to donate stock versus a cash donation. The total value of the current fair market value of the stock is tax deductible and you do not need to pay capital gains taxes. You can donate appreciate stock, bonds, or mutual funds to the Foundation. Consult your financial/tax adviser for specific tax information. 14. Do I need to fulfill my annual pledge in one donation? No, you can make multiple donations during the year, and by multiple means as stated above. 15. Can my company’s match count toward my pledge? A company match is eligible to elevate you to a higher circle once you have personally donated at least at the Leadership Circle level. 16. How do I make a monthly recurring donation? Contact Maggie Nokes, Assistant Director, and she will send you a special link and instructions. 17. What happens after I join? Other than feeling awesome about yourself? With your permission, we’ll add your name to the Member list so others can see how awesome you are. We’ll send you updates on the impact of your generosity. You’ll be invited to the members-only Selection Summit luncheon in March, at which Members deliberate on the funding award applications from patient care organizations. And you and your guests will be invited to the MMLC Funding Award Celebration reception in April where the patient care funding is presented to recipient charities. 18. I am already a Member, how do I maintain my membership? You maintain your membership each year by fulfilling your annual pledge. After completing the 3-year commitment, we hope you’ll want to continue your impact by making another 3-year pledge!